Whether it is for special promotions, restaurant menus, or informational purposes, Table Tents are a direct form of advertising directly to your customers. 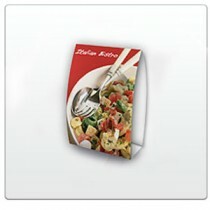 Available in two popular sizes, Table Tents will allow you to effectively communicate with your customers with ease. To save you shipping and time, they are shipped flat and are extremely simple to assemble!